Once every 2 years, the dental world has a rendezvous in Cologne. Dentists, dental technicians and industry tradesmen come to be expansively informed about the latest innovations and cutting-edge developments which promote success on the world dental market. The IDS is the exceptional event where the dental trade and the public at large get a first-hand look at what is being introduced into the dental market. Lectures and seminars given by experts in their fields are also a hallmark of the IDS. 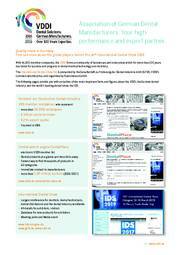 The IDS is successful thanks to visions, goals, strategies, motivation and last but not least, hard work. The foundation of our future IDS strategy is the "IDS brand core". A working group from the dental industry developed the IDS brand core during months of work (2016-2017), supported and supervised by an agency for brand management, and drafted its key statements. The IDS is organised by the business enterprise of the VDDI, the GFDI (Society for the Advancement of the Dental Industry). Our dental industry is responsible for ensuring the world's leading trade fair IDS remains on course for success so we can develop it further into the future. The result of the workshop process to define the IDS brand core is a clearly structured system of values, orientated on the success of all involved at the trade fair and includes several performance pledges. The IDS brand core values form the basis and guidelines for current and future measures for the advancement of the IDS. Like this, the Dental Show continues the groundwork and developmental steps made by preceding generations in the VDDI (VDDF). The IDS brand core is the present-day expression of a historically based self-conception of our industry and its International Dental Show. 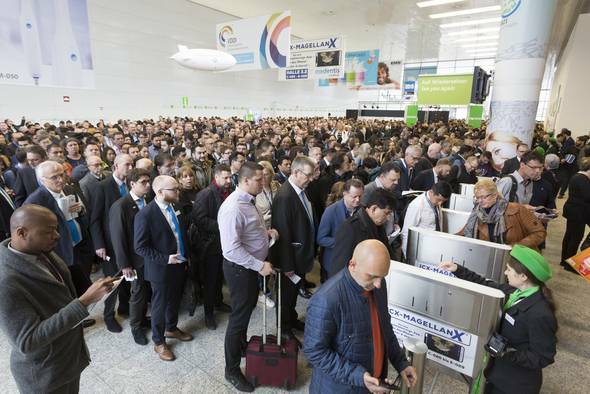 IDS 2019, which came to an end in Cologne on 16 March 2019 after five days, more than fulfilled the high expectations of the international industry. As such, the undisputed leading global trade fair of the dental industry once again underlined its exceptional position. The event was able to replicate the very good results of the previous event and at the same time realise the ambitious goals for more internationality and higher quality in the offer and demand. The outcome of the trade fair consequently led to satisfied exhibitors and trade visitors. With 2,327 companies from 64 countries, the number of exhibitors rose once again by good twenty suppliers. They came together with over 160,000 trade visitors from 166 countries. Hence, the overall number of visitors rose by 3.2 percent, the number of foreign trade visitors by 6 percent indeed. At the same time, the exhibition space expanded by over four percent up to 170,000 m². Mark Stephen Pace, Chairman of the Association of the German Dental Manufacturers e.V. VDDI: "The motto "The sportsmanlike fair competition of IDS" expressed in six words the strengths of this leading trade fair: The comprehensive and internationally unique offer as well as the extraordinary high performance and innovative strength of the industry, combined with the firm intention of all market players to improve continually and seek the success in the direct competition. Everyone, who wants to be successful in the dental industry, faces the performance comparison in Cologne. It is thus no surprise that the level of internationality of IDS has in the meantime taken on huge dimensions." 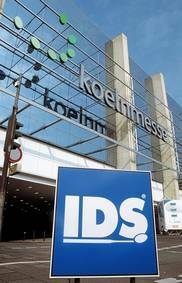 And Gerald Böse, President and Chief Executive Officer of Koelnmesse, added: "IDS is a trade fair event in a class of its own and always sets new benchmarks. It manages to surpass the already excellent result of the previous event every time again and again. The visitors and exhibitors are impressed by IDS, supply and demand are only provided in this scope, in this quality and with this level of internationality here in Cologne. IDS is the undisputed leading global trade fair for the dental industry." The official figures confirm the excellent level of internationality at IDS: 73 percent of the exhibitors from 64 countries came from abroad, as well as 62 percent of the visitors from 166 countries - from Argentina, Brazil and Chile, to Japan, Korea, Egypt and South Africa, Australia and New Zealand, the whole of Europe through to the USA and Canada. The number of countries of origin thus increased once again by 6 percent. 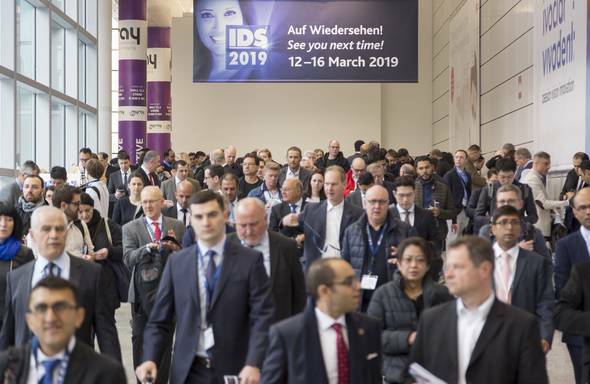 IDS 2019 recorded significant growth in the number of visitors from Asia (+23.1 percent), Eastern Europe (+19.6 percent), Africa (+17 percent), Central and South America (+14.6 percent) and North America (+5.3 percent). However, not only the level of internationality and quantity of the visitors was particularly praised by the exhibitors of IDS 2019. At many exhibition stands one heard that IDS above all convinced with the high quality of its visitors. An independent survey confirms this impression: In this way, over 80 percent of the visitors at this year's IDS are involved in procurement decisions, indeed 32 percent of them decisively. The decision-making competence among the foreign visitors is even higher - over 49 percent stated that they are autonomously responsible for the procurement decisions. At the stands one reported that all of the occupational groups of the industry from all over the globe were present. According to the survey, the largest groups came from the dental practices, dental laboratories, dental trade and from the dental industry, but schools and universities were also strongly represented. Almost 30 percent of the respondents are either board members, company or plant managers. Almost 80 percent of the visitors were satisfied or very satisfied with the range of exhibition offerings. Good 93 percent said that they would recommend a good business acquaintance to visit IDS. And 70 percent of the respondents are already planning to visit the next IDS in 2021. Dr. Markus Heibach, CEO of the VDDI, was also correspondingly pleased when the trade fair came to a close: "The high level of satisfaction of our trade visitors and exhibitors is for us the impressive confirmation of our efforts to make our guests' stay as pleasant and successful as possible by offering them a cosmopolitan, hospitable and perfect service." The radiance of IDS makes it the ideal business platform especially for new companies on the dental market, which want to establish themselves with high-quality innovations. Steve Plakotaris, CEO & Managing Director of the Australian start-up, Dr. Mark's HyGenie, confirmed this: "As a world first oral hygiene innovation, with global brand potential, it made perfect sense to debut our company and removable oral appliance hygiene range at the world’s biggest and busiest dental industry showcase. Despite being a small Australian start-up, we have felt right at home at IDS and the results have exceeded all our expectations. Contacts, connections and new friends are being made every hour of every day. We look forward to booking our place at IDS2021." "The International Dental Show (IDS) is a phenomenon: The atmosphere is so international, thirsty for knowledge and open that it is was simply very inspiring once again this year. The digitalisation can improve the workflows of the practices, but shouldn't be implemented noncritically or too hastily," said Dr. Peter Engel, President of the German Dental Association (BZÄK) and underlined the significance of the dental industry as a job driver in the health sector. Dentistry is a significant employer and economic factor." A local dentist employs between four and five employees on average. Trained dental employees are the heart of every dental practice - without them a practice wouldn't work. Good skilled dental employees therefore require recognition as well as inspiration and know-how." The same also applies for dental technicians. Dominik Kruchen, President of the German Dental Technicians Guild, summed up as follows: "The International Dental Show demonstrated at what speed the digital dental world is developing. One has to weigh up the risks, recognise one's own chances and take investment decisions based on good judgement." In the discussion about the role of the dental laboratories, master dental technicians and their teams are irreplaceable as experts in the provision of dental restoration, Kruchen added. In close exchange with the dentists, their expertise, for example regarding the selection and implementation of different materials, ensures an individual offer for patients. "Well-trained young professionals are important for a strong dental technician trade. The highly trained young dental technology apprentices once again impressively demonstrated their skills at this year's IDS in the scope of the Gysi Prize Competition." Following tradition, the BZÄK Conference of the Aid Organisations also took place at IDS. It is a source of ideas for dental aid projects and for the personal exchange. Around 60 dental aid projects and organisations are currently represented among the BZÄK network, the essential aim of which is to provide mutual assistance and an exchange. The projects provide aid and support in manifold ways at home as well as worldwide: In Germany many dentists are very committed to helping people who are socially deprived or in emergency situations in their free time. They treat people without health insurance or offer the aid organisation support in the form of donations in kind or money. Many dental aid organisations also assert themselves for international projects and help in acute humanitarian situations or after natural catastrophes, they provide assistance in crisis regions or offer the patients dental treatment locally. *The figures relating to visitors, exhibitors and exhibition space for this trade fair were determined and certified according to the standardised definitions used by the Society for Voluntary Control of Fair and Exhibition Statistics (FKM). 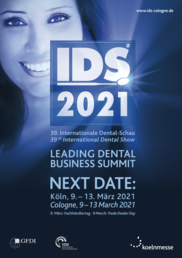 The next IDS - the 39th International Dental Show - is scheduled to take place from 9 to 13 March 2021.